The “Three Pillars of Application Design” is Crow Canyon’s unique approach to developing applications that engage users, streamline processes, and provide reporting that drives service delivery optimization. 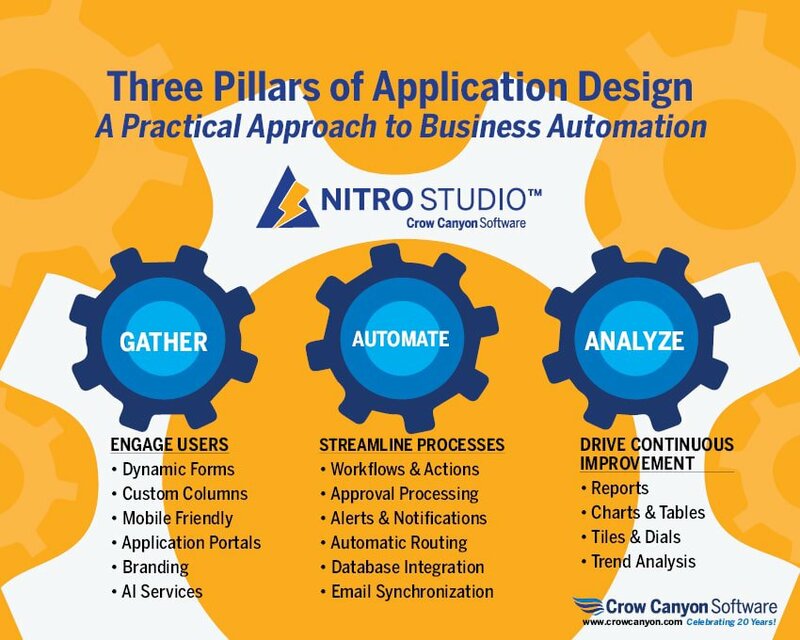 This Three Pillar approach is the foundation of NITRO Studio™, our application service layer, that powers up SharePoint and Office 365 to become true business application platforms. We have developed numerous applications and custom development projects based on NITRO Studio™. We now also offer NITRO Studio as a stand alone product. Check out the information below and the links on this page to see how Crow Canyon can deliver robust SharePoint and Office 365 applications that drive efficiency and productivity at your company or organization. Workflows can be simple or complex – either way, NITRO’s™ many capabilities deliver the routing, approvals, processing, tracking, and alerting needed for serious and substantial business applications.